The Financial Times is reporting that China is expected to overtake the United States as the world’s largest economy in 2014. India, is now the world’s third largest economy. These numbers are based on Purchasing Power Parity calculations done by the International Comparison Program of the World Bank. Considered to be the authoritative source for global GDP figures, the first round was conducted in 2005. Results of the second round, in which country GDPs were calculated for 2011, were released today. The International Comparison Program (ICP) is a worldwide statistical partnership to collect comparative price data and compile detailed expenditure values of countries’ gross domestic products (GDP), and to estimate purchasing power parities (PPPs) of the world’s economies. Using PPPs instead of market exchange rates to convert currencies makes it possible to compare the output of economies and the welfare of their inhabitants in real terms (that is, controlling for differences in price levels). via ICP 2011: International Comparison Program. 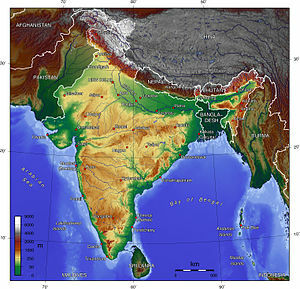 The summary report, available here, states that India’s GDP in 2011 was $5.75 trillion, China’s was $13.5 trillion and the US was $15.52 trillion. 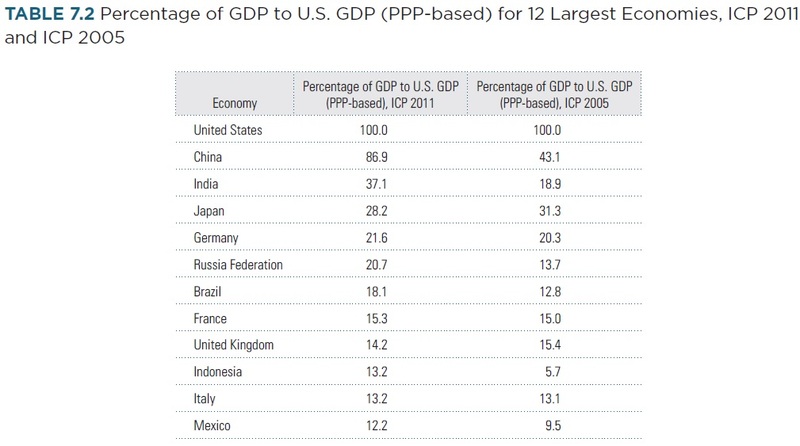 In the period 2005-2011, China and India’s economies doubled in size as a percentage of US GDP. China’s GDP grew from 43% to 87% of the size of the US economy, while India went from 19% to 37%. 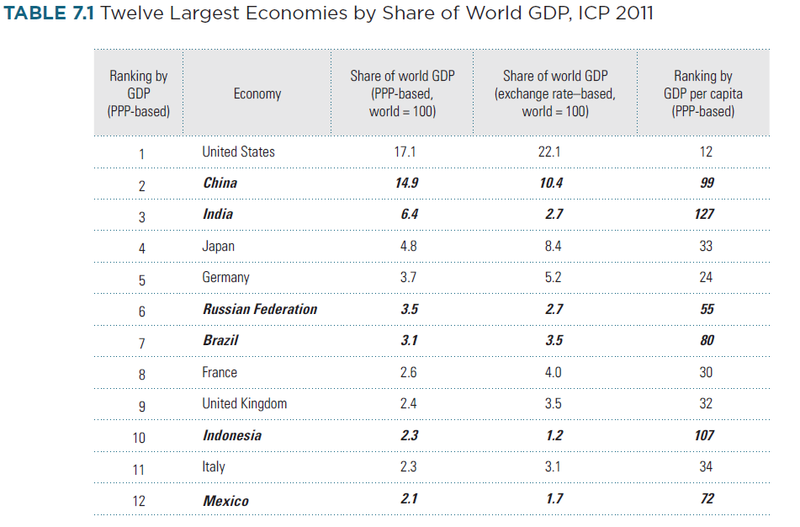 Based on economic growth estimates for the period 2011-2014, it is expected that the China will overtake the US this year. A surprising finding of the ICP is that India has one of the lowest price level indexes in the world. Or in other words, India has some of the lowest priced goods & services in the world. [This is something the average Indian will find hard to digest due to the double digit inflation witnessed over the past decade!]. Unsurprisingly, India ranks 127 in per capita GDP. Several economic indicators are turning red for India. Instead of the predicted double digits, GDP growth is expected to languish in the 5-6% range in the present and coming years. The rupee is at a life time low and the stock market is the worst performing index among developing nations. Several factors are blame, including high interest rates (which are necessary to control runaway inflation of 9-10%) and a governance deficit (no major economic reforms have been passed in the past 6 years). Other underlying structural problems in the economy include a banking system crippled by bad debts, and stubborn current account, trade and fiscal deficits. India’s economy can seem like a bicycle—it needs to keep moving fast to be stable. Once conviction in the destination falters, companies curb investment and hope turns to fear that the country’s problems may be intractable. It seems that inflation is the root cause of several of these problems – much of food inflation is caused by the country’s creaking infrastructure that leads to severe waste and fluctuations in commodity and food prices. This puts the recent reversal of a decision to allow international organized retail players into India, into greater focus. Scholars have long argued that FDI in the retail sector will help develop the necessary supply chains and cold storage infrastructure that a 21st century economy needs. It will also help to drive down food prices, benefiting consumers and the country’s growth prospects in the long run. Read more at India’s economy: Slip-sliding away | The Economist. Considerable online and print real estate has been dedicated to the recent announcements by Netflix and Blockbuster. However, it seems that neither company has paid much attention to the critical B word – bundling. Till recently, Netflix was the darling of Wall Street. It was also a much analyzed case study in class rooms. Netflix was toasted as an example of how to disrupt an industry with a new technology enabled offering. The success of Netflix was in many ways responsible for the bankruptcy of Blockbuster, which was a behemoth of the traditional movie rental market. Netflix offered a eat-as-much-as-you-can streaming option along with a 1, 2 or 3 DVD-in-the-mail option. Bundled together. Then, Netflix did two things – first, it increased prices by 60%. Second, it announced a split of its bundle. It announced that streaming and DVD-in-mail services will be separated into two different companies, with different websites. Outraged users have been leaving in droves. The Netflix stock is down by more than 50%. However, this might just be the beginning. The real value destroying act is not the price increase, but it is the impending unbundling. Blockbuster on the other hand, after being acquired by Dish Network, has announced a combined streaming, mail and on-demand service. It promises a 100,000 strong library and unlimited DVD / BR exchanges through its numerous retail locations. While the offering sounds strong at first look, the fine print shows that only Dish subscribers can avail of it. Why did we get here? Netflix clearly understands that digital streaming services are going to disrupt the industry, much like its DVD-in-the-mail plan did in the nineties and early noughties. It also realizes that it has to increase the size of its streaming library, and hence pay top dollar to the content owners. These seem to be the most plausible reasons behind its recent actions. While this is a great strategy in the medium term, a medium term strategy is only good if you are able to survive the short-term. What’s the bungling / bundling issue? Consumers appreciate the resulting simplification of the purchase decision and benefit from the joint performance of the combined product. I need to watch something, at this time. I need to watch this thing, at some time. With the unbundling of this product, Netflix users have been greatly inconvenienced. They have to pay 60% more, and have to spend much more time maintaining two separate queues of movies on two different websites. Consequently, they seem to be looking to shop elsewhere for their needs. For example, to meet their ‘I need to watch this thing, at some time’ need, they may go to iTunes or RedBox. Similarly, to meet their ‘I need to watch something, at this time’ need, they may turn to Blockbuster. Or so seems the thinking at Dish headquarters. However, the bundle offered by Dish is a $30 quad-play. It contains the DVD, streaming and on-demand plus Dish cable. Hence it is more likely to appeal to customers who are primarily searching for a cable provider. Furthermore, reports suggest that Blockbuster’s streaming library is less than 5,000 titles – as compared to a paltry 20,000 for Netflix. Hence it is not a one for one replacement. Clearly, both companies are bungling the bundling. Thus there is now a large unmet for a bundle that offers unlimited streaming and DVD, at an affordable price, in a convenient manner. Netflix’s abandoning of this market has hurt it already and will certainly continue to hurt it in the short-term. If it is lucky and no serious competition arises during this period, then it may be able to flourish in the medium and long-term.